Are any of you already thinking ahead to summer time and the lazy days of no school? Here in Texas, the weather is already getting warm, we've hit the mid to upper 80's this week. 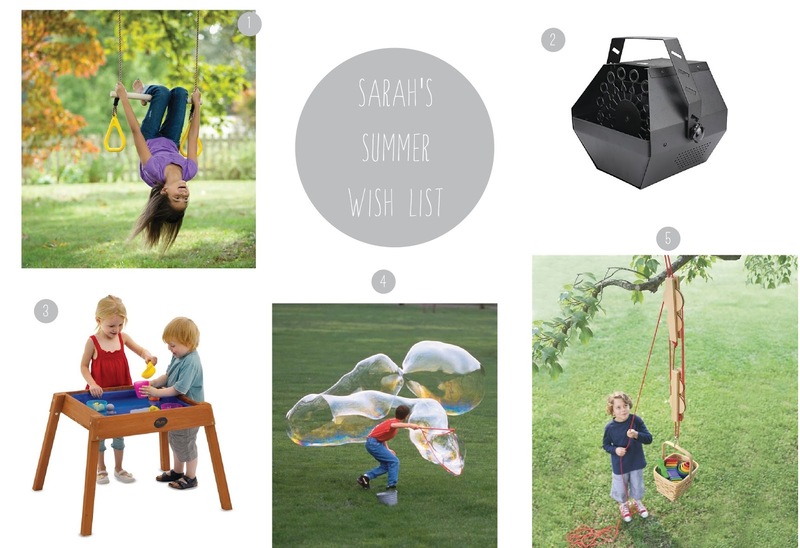 The weather combined with the fact that there are only 6 weeks of school left has me thinking about the summer and getting some fun outdoor toys together. 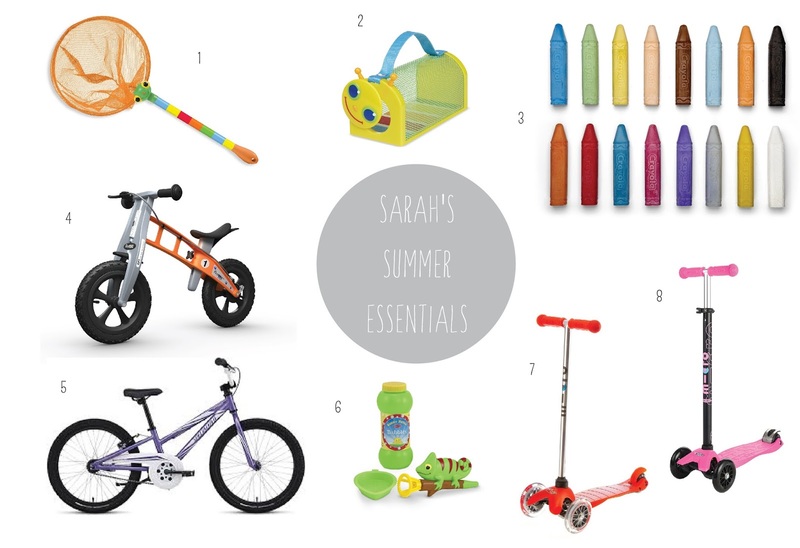 My kids love being outside, and these are the items I think of as must haves for our family. 1. & 2. These bug catching supplies are adorable and kid sized, I also like that the bug houses come in a few different style so I can easily tell them apart. If you have kids who love finding bugs and keeping them for observation I highly recommend these. 3. We go through a lot of sidewalk chalk. Whenever I see it on sale I stock up because this is something they always come back to. Whether it is making drawings down the sidewalk, tracing outlines of their bodies or coming up with hopscotch boards there is always a demand for chalk around here. 4. We got this bike for my son's 2nd birthday. I researched a lot of balance bikes and went with this one because of how long it lasts (the seat is adjustable) and the fact that there is a hand brake he can use once he starts going really fast. The quality is wonderful. 5. My 7 year old got this for her last birthday as well. My husband and I both bike and wanted to get a good quality "big girl" bike for our daughter. While this bike is more expensive than something you would find at a big box store the quality reflects that. It is easy to ride, easy to use the breaks and should last her for a few years. For us, the investment was worth it. 6. Bubbles are a must around here as well. We almost always have some type of bubble around the house, bubble blowers, bubble wands, bubble machines etc. When you have a toddler who loves bubbles you are always on the look out for the most entertaining bubble items. I love these bubble blowers because they are fun for kids to use and you can ration out the bubble solution into the little container with it. 7 & 8. Yes, these scooters are everywhere because they are awesome. Both my kids love their scooters and alternate between scooter and bike. The mini kick is wonderful for toddlers while the maxi kick is wonderful for taller toddlers and beyond as the height is adjustable. 1. How fun does this ring swing play set look? The only thing holding me back from purchasing this is that our trees are above rock instead of grass. 2. We've gone through a few bubble machines, so I think it may be time to enter the world of professional bubble machines. 3. I am torn about a sand and water table, I think my kids would love it but I am not so sure about the bug situation. I definitely do not want to create a mosquito habitat with the water table. Still contemplating this for Texas, if we lived somewhere else I would buy this in a heartbeat. 4. It's only a matter of time before we add this Bubble Thing to our bubble arsenal. Make mammoth bubbles with ease, yes please! 5. This pulley set is adorable. How much fun would it be for kids to haul their supplies up a tree, or to the second story of a house. I would love to hear what your summer essentials are, and anything you have your eye on for this summer season.